I’m all about bowl meals. I eat nearly all my meals in the form of a bowl because they’re just SO good! There’s usually a grain, some sort of protein, veggies, either roasted, sautéed, or raw, greens, and some type of sauce/dressing! It’s the perfect vehicle for tons of flavor and texture. I am semi-obsessed with these meatballs, because they contain two of my favorite proteins. Pork and shrimp! They’re my top two faves, no contest. Pork is a given because of pulled pork and bacon (what’s better? ), and I have always loved shrimp since I was a little kid. So putting them into a meatball?! Together?! Is pretty much the best thing that I’ve ever done. The flavor here is INSANE. 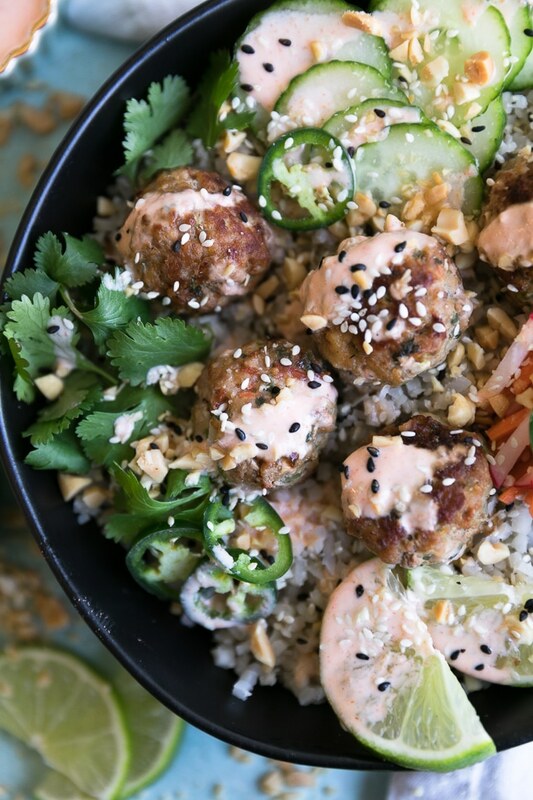 The meatballs are filled with scallions, cilantro, jalapeño, garlic, sesame oil, and soy. Talk about flavor explosion. I could NOT stop eating them. Then, I made some quick pickled veggies with rice wine vinegar, honey, and salt. They’re amazing. Anything pickled and briny and I’m in! Instead of using rice for these bowls, I made cauliflower rice. But feel free to use regular rice or even rice noodles! Both would be super delish. I decided to serve them over cauli rice because I’ve been trying to get in as many veggies as I can after the holidays. Because a few too many cookies and carbs were consumed. I’m sure you can relate! And I just LOVE veggies. I’m one of those weirdos that craves veggies at all hours of the day. The little sauce I drizzled over these bowls is just plain Greek yogurt (my favorite swap for sour cream and/or mayo! ), mixed with sriracha, lime juice, garlic, and salt. Super simple and just gives these bowls and extra little something. 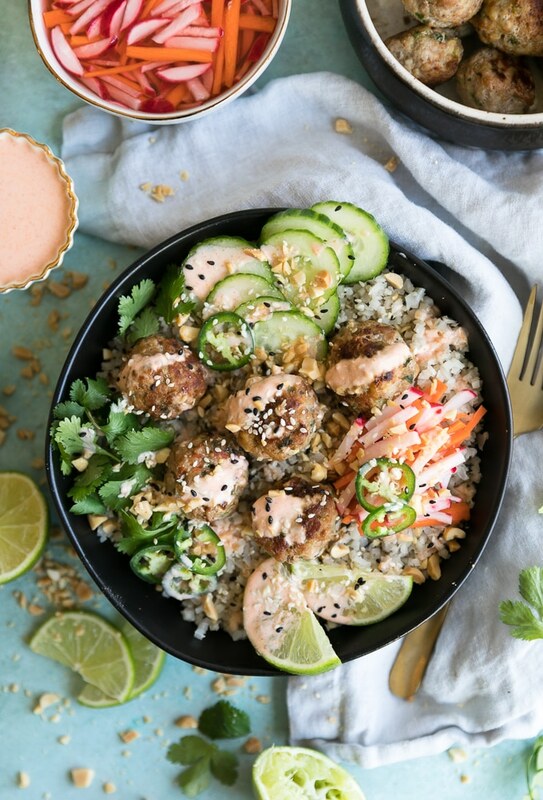 And if you’re into meal prep, these bowls are PERFECT for it! 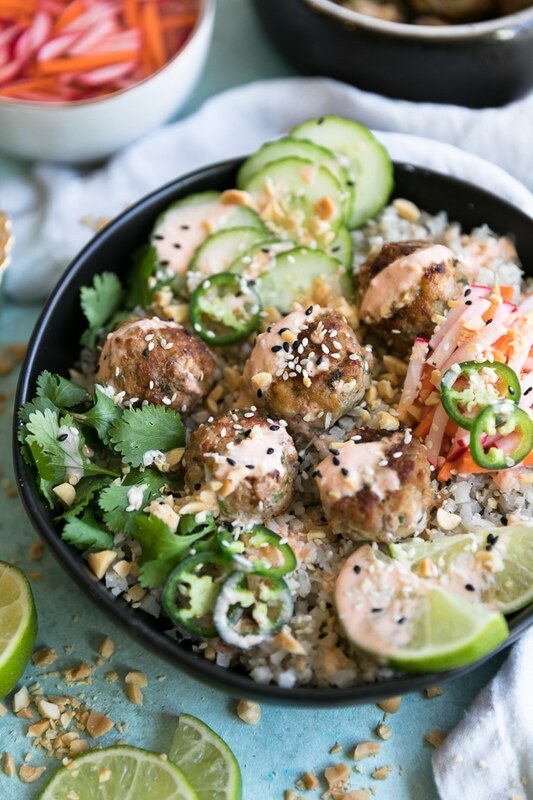 These bahn mi bowls are topped with pork and shrimp meatballs, quick pickled veggies, and a sriracha lime sauce! 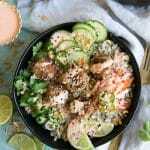 They are served over cauliflower rice and are fantastic to make for meal prep too! Make the pickled veggies. In a jar or sealed container, combine the rice wine vinegar, honey, and salt. Shake to combine. Add the radishes and carrots and let sit while you prep everything else. Make the meatballs. Combine the shrimp, scallions, jalapeño, cilantro, garlic, sesame oil, soy sauce, and a pinch of salt and pepper in your food processor. Pulse until very finely chopped. Add to a medium mixing bowl and add the ground pork. Work the mixture together with your hands until combined, then roll into 20-22 meatballs. Heat a large nonstick skillet over medium heat and add the olive oil. Brown the meatballs 5-6 minutes per side, or until golden and crusty on the outside and cooked through. I like to tent a piece of foil over the pan to help keep the heat in! In the meantime, make the sriracha sauce. 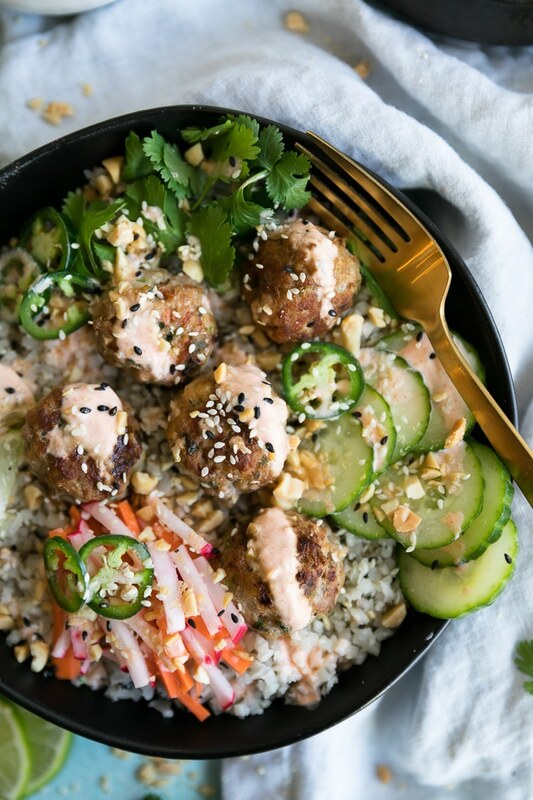 In a medium bowl, combine the greek yogurt, lime juice, garlic, sriracha, and a pinch of salt. Whisk until smooth, then add milk or water until desired consistency is reached. 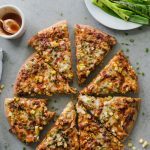 I like it to be on the thinner side so I can drizzle it easily! Make the cauliflower rice. Heat a large skillet over medium-high heat and add the sesame oil. Once hot, add the cauliflower rice and sauté for a few minutes until heated through. Add the sesame seeds and stir to combine. 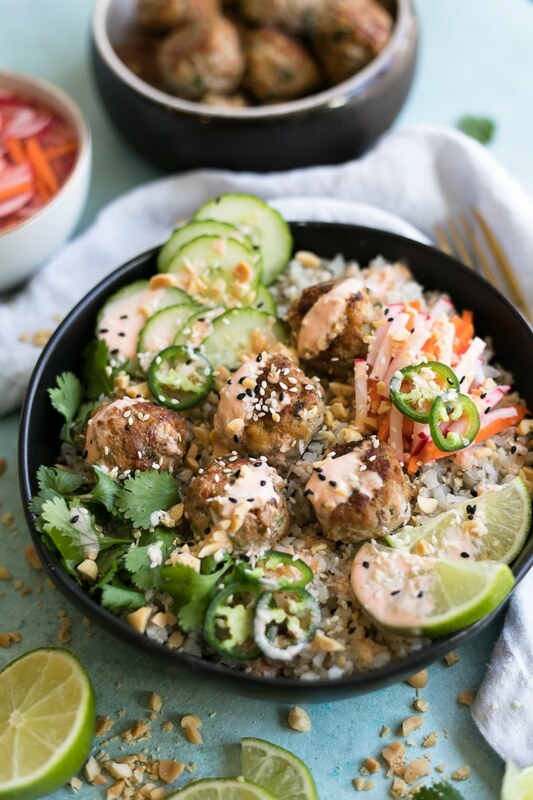 To serve, place several meatballs over a bed of the cauliflower rice, then top with the quick pickled veggies, sliced cucumbers, a drizzle of the sriracha sauce, extra sesame seeds, chopped peanuts, chopped cilantro, jalapeño slices, and a squeeze of lime!